ATPDraw for Windows is a graphical, mouse-driven pre-processor to the ATP version of the Electromagnetic Transients Program (EMTP). It assists to create and edit the digital model of the electrical network to be simulated, interactively. In the program the user can construct an electric circuit, by selecting predefined components from an extensive palette. The preprocessor then creates the corresponding ATP input file, automatically in correct format. Circuit node naming is administrated by ATPDraw and the user only needs to give name to "key" nodes. ATPDraw now supports about 65 standard components and 25 TACS objects. A simplified usage of MODELS is also possible. In addition, the user can create his own circuit objects using the Data Base Module and the $INCLUDE option of ATP. Both single phase and 3-phase circuits can be constructed. Multiple circuit windows are supported to work on several circuits simultaneously and copy information between the circuits. Most types of edit facilities like copy/paste, rotate, import/export, group/ungroup, undo and print are available. Other facilities in ATPDraw are: a built-in editor for ATP-file editing, support of Windows clipboard for bitmap/metafile, output of Windows Metafile/Bitmap file format or PostScript files. ATP, TPPPLOT, PCPlot can be executed directly from ATPDraw in version 1.5 or later. ATPDraw is most valuable to new users of ATP and is an excellent tool for educational purposes. It is to be hoped, however that even experienced users of ATP will find the program useful for documentation of circuits and exchanging data cases with other users. 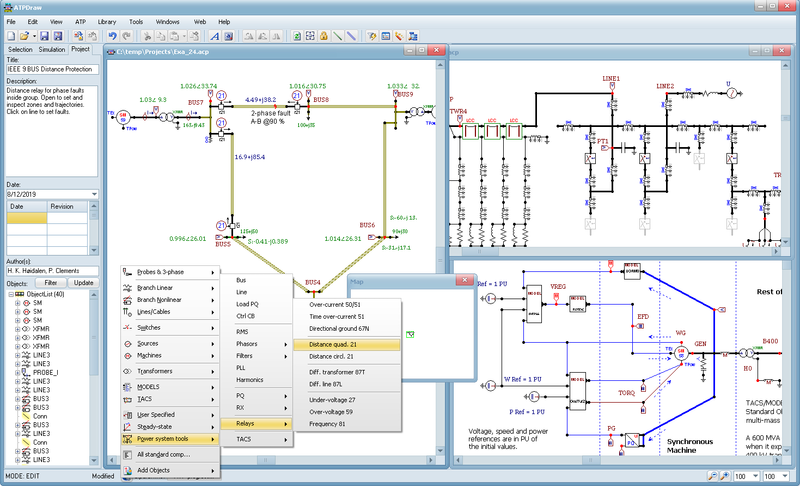 The possibility of building up libraries of circuits and sub-circuits makes ATPDraw a powerful tool in transients analysis of electric power systems. The ATPDraw package also includes the ATP_LCC program for Line/Cable constants support and a utility, that makes possible the usage of existing circuit files created by the previous (DOS/GIGS) versions of the program under the new environment. The program is written in Borland Pascal. Two functionally very similar versions of ATPDraw exist. A 32-bit version which is written in Borland Delphi 2.0 runs only under Windows 95/NT and a 16-bit version compiled with Borland Delphi 1.0 for Windows 3.x. ATPDraw is a trademark and copyright of SINTEF Energy Research, Trondheim, Norway. It is programmed and maintained by Dr. Hans Kristian Høidalen. The ATPDraw for Windows program is royalty free and can be downloaded free of charge from the ftp server ftp.ee.mtu.edu (user:anonymous, password: your e-mail address). The proprietary rights of the program belongs to the Bonneville Power Administration, USA, the company who financed the program development and the SINTEF Energy Research (formerly EFI), Norway. User Manual for ATPDraw for Windows version 5.6 is available here in Acrobat PDF format .